Whether you’re a complete novice or keen snorkeler, trying out one of the new full face masks can change the way you snorkel and make it a much better experience. There are many people who don’t get on with it the first time they try, but a full face mask is designed to make breathing and visibility a lot clearer and easier, so you can simply relax and enjoy the experience. When considering a full face snorkelling mask, there are many benefits. The curved lens of the mask like the Siliber 180° New Full Face Snorkel Mask will give you a completely unobstructed 180 degree view, and there is less chance of water breaching the seal and affecting your view. You can also breathe through both your nose and mouth, which makes everything a lot easier. If you’re a bit more experienced, then look out for a snorkelling full face mask that allows you to attach a go pro, like the WSTOO 180° Full Face Snorkel Mask, so you can capture your underwater adventures. Check out our full list below for all ages and capabilities. This 180 degree mask is great for kids learning to snorkel, but can also be great for those who are more advanced as well. You’ll have a completely unobstructed view, and you’ll even be able to mount your go pro on this mask so you can capture everything you see. It’s comfortable on the face and you can breathe naturally either though your mouth or nose without the mask fogging up. This is a great snorkelling full face mask for beginners. If you always struggled with finding a regular snorkel mask that was comfortable on your face, then this full face mask for snorkelling could change that. It is easy to adjust to fit your face comfortably, and the extra-tight silicone seal means that absolutely no water is getting in and obstructing your view. The separate breathing chamber means no fogging, and the mask is completely unobstructed for 180 degree viewing. 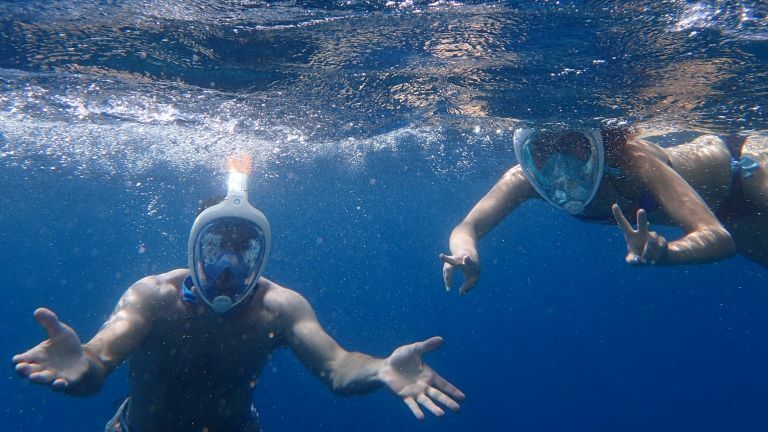 Users found this mask to be very good with no leaks and the perfect way to enjoy surface snorkelling for hours with the best view of the sea below. Ensure continuous uninterrupted views with this anti-fog snorkelling full face mask. This mask has air circulation which will ensure fog doesn’t get in the way of your vision, and with the dry top snorkel, it also limits water from entering through the top of the snorkel. You have a valve which will expel excess water when you raise your head. Users have this is perfect for shallow snorkelling and the mask sits comfortably on your face. Unlike other snorkelling full face masks that have a fish-eye lens, this mask has a flat faced lens which makes it easier to see what’s around you, with a more accurate distance and you’ll find you won’t get as dizzy as you might do with a fish-eye lens. If you find that you get headaches when doing this kind of activity, the lens on this mask should reduce that significantly, and you also won’t suffer from fogging with the streamlined airflow. This mask is easily adjustable and many have found it to be comfortable on any size head. It gives you a wide angled lens so you can see as much as possible, although some have said it can get a little foggy. The seal, however, is very good and users found it to keep water out during their activities. It’s a good mask for beginners, but the more advanced snorkelers may be disappointed to find you can’t attach a go pro. If you’re just starting out or want to teach your children to snorkel then you can expect this mask to serve you well. This adult snorkelling full face mask comes with a flat lens which makes swimming safer and easier, an extra- long breathing tube for going down deeper and a set of earplugs to protect the ears. You’ll also get a handy travel bag so you can keep your mask clean and free from sand when down at the beach, perfect for regular snorkelers who want to keep their belongings safe and dry. It is said to be easy to adjust and it comes with two spare seals should you ever need them.